Tacoma's Espionage Cosmetics has found a cosmetics market that's been ignored by mainstream companies: Nerds. Tacoma, Wash. — Espionage Cosmetics in Tacoma makes makeup for nerds, and that means for everyone. "Everyone has a little bit of a nerd in them, whether it's for literature, comic books, or just glitter,” said Julie Chase, an Espionage employee. Basically, this company says your inner geek is gorgeous. "There's a saying, follow your heart but take your brain with you," said co-founder and glitter Jedi Jaimie Cordero, who got interested in cosmetics later in life, as a way to be creative, not just cover flaws. In 2011 she made, and sold, nerd makeup at Seattle's Geek Girl Con. "It wasn't as weird as I thought it was. That there were other girls like me. It was a market that was being ignored. Not even underserved, they were not even treated like they existed in the first place." "I actually started wearing makeup because of Espionage Cosmetics. I didn't really wear makeup before at all." Now, two Kickstarters later, espionage has a worldwide following. It's the only place you can get a manicure designed by NASA scientist Bobak Ferdowsi. It's also the only place with an eye shadow palette based on Harry Potter spells. “We want to wear something that's Muggle friendly, but also the other wizards are like, oh, okay, I see you. It's like an indicator, Cordero said. "They are one of the fan favorites because they have this hidden, glow in the dark Easter egg -- where the full moon is not a moon, it’s a death star!” said Chase, revealing it with a black light. Espionage even collaborates with geek celebs. Ashley Johnson - of NBC’s Blindspot – recently was transformed into everyone from Sherlock Holmes to Spock for a product launch. 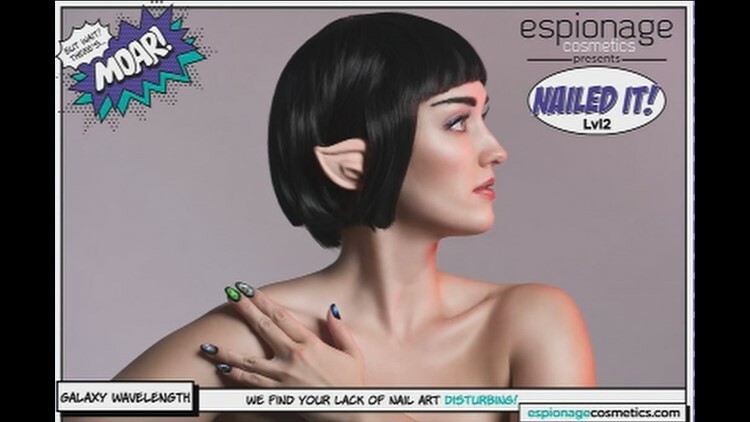 Espionage calls their fans the 'glitter army', and together, they continue to boldly go where no makeup company has gone before.